Many homes are missing that one thing that will set them apart from the other properties on the block or in the neighborhood. For many luxury and historic homes, that one thing is decorative cedar shingles. We’ve become too used to traditional roofing materials, to the point where all roofs tend to blend in with one another. But when installed properly on the right home, decorative roof shingles can make a home’s attractiveness come alive. They mesh with the existing architecture and look and feel, enhancing every aspect of a home’s appearance. At Custom Shingles, decorative wood siding shingles are among our specialties. For 40 years, we’ve been helping homes reach their full potential through the installation of high-quality decorative wood shingles. What Makes Decorative Wood Shingles Different? What sets decorative cedar shingles and other decorative wood siding shingles apart from other roofing materials? First and foremost, they provide a head-turning attractiveness that you simply don’t get with more commonly used roofing materials. 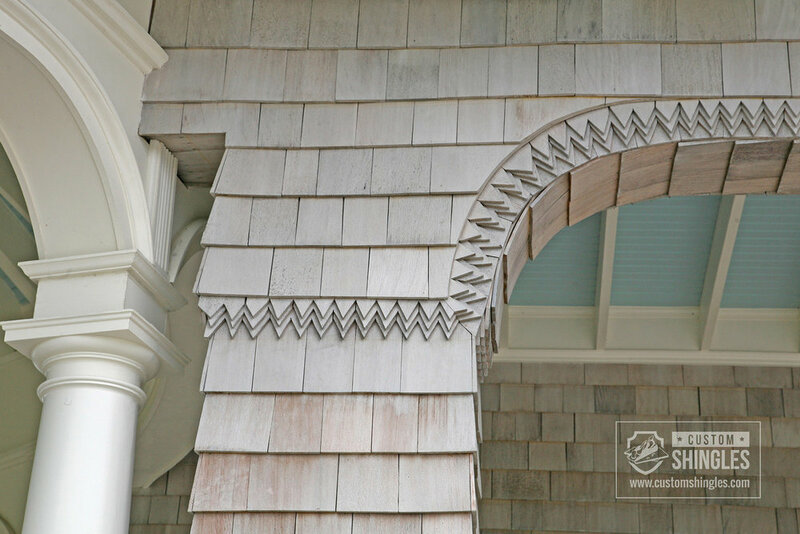 Crafting decorative wood shingles requires artistic ability and careful attention to detail — and that ability and attention to detail shines through in the finished product. Also, decorative wood shingles are also more durable than more common roofing materials. While you may pay more upfront for materials and installation than you would with a traditional roofing material, both the shingles and the installation will last for decades to come, giving you added value that underscores the premium appearance of your roof and its dramatic impact on your home. What Types of Homes Benefit From Decorative Roof Shingles? Decorative cedar shingles aren’t a perfect fit for every property. But there’s a wide range of housing styles that do make a good fit. First of all, it’s important to have an era-appropriate home: Either one that was built during a certain time period or that looks like it was built decades ago. Most often, decorative shingles are installed on older coastal-style homes as well as Nantucket-style cottages. New England shingle homes are also ideal for harnessing the dramatic power of a roof made of decorative wood shingles. One of the best parts of choosing decorative shingles is that you enjoy an array of different design options. You may have in mind exactly what you’re looking for in decorative roof shingles, or you may need some expert guidance as you consider your options and look for the perfect complement to the rest of your home’s architecture. Of course, we live and breathe decorative wood shingles here at Custom Shingles. We’re always glad to talk you through your options and make expert recommendations based on your home and your unique preferences. Get in touch at any time with questions or to request a free quote on decorative wood siding shingles for your home. There’s nothing accidental about the beautiful appearance and long-lasting durability of a roof made of decorative shingles. At Custom Shingles, creating beautiful roofing solutions and delivering outstanding results to our clients has been a passion for more than 40 years. While mainstream roofing companies may claim to be able to install decorative roof shingles, this type of work is our specialty. Crafting the perfect roof made of decorative wood shingles takes care and attention to detail. More than anything, it takes lots of practice and tons of experience. Mainstream roofing companies simply can’t replicate the experience and knowledge you get when you choose Custom Shingles. In fact, our work is impressive enough that it’s been featured in highly sought-after style and design magazines like Veranda, Better Homes and Gardens, Vogue and Country Living. We give our all to each client and to each project because we care about creating beautiful roofing solutions that help homes reach their full potential. Whether you’re interested in decorative wood shingles or another premium roofing solution, we are your best option from among wood roofing specialists. We pour all of our experience into each job, and our team is helpful, friendly and efficient throughout the process, helping you to make the right decisions while limiting the disruption to your home and your lifestyle. When you have questions, we have answers. And when you’re ready for the power of a roof made of decorative cedar shingles, we’re ready to get to work. Contact us today about decorative cedar shingles for your home!